OXFORD, Miss. — Drawing on one another’s expertise, a trio of University of Mississippi faculty members from different areas of campus has created a patent-pending device that could change the lives of people who stutter. Paul Goggans, an electrical engineering professor, developed the prosthetic device, about the size of a cell phone, with Greg Snyder, associate professor of communications sciences and disorders, and Dwight Waddell, associate professor of health, exercise science and recreation management. The friends began working on the device after Snyder, himself a lifelong stutterer, demonstrated how he could speak much more fluently simply by feeling his throat while he and Waddell chatted over coffee. “By feeling my throat vibrate when I speak, I get tactile speech feedback, which significantly reduces my stuttering,” Snyder said. “Dwight immediately understood my application of speech feedback and neural circuitry, and he then approached Paul, who agreed to make the device development a senior-level design project in his class.” Since that time, the team has been focused on supporting and empowering the stuttering community by fighting social stigma and challenging the normal remedies associated with stuttering. “Our device is portable, battery-powered and easy to use,” said Goggans, professor of electrical engineering and lead partner in the instrument’s design and fabrication. “These are important attributes because other behavioral treatments for stuttering are more intense; they require too much concentration and are exhausting.” A prototype of the device was presented Tuesday (Oct. 16) as a “Hot Topic” at the 2012 Society of Neuroscience conference, which runs Oct. 13-17 in New Orleans. The paper is among 150 selected from thousands of submissions. An audience of about 33,000 neuroscientists and media representatives is expected at the conference. Even after a long day of speech therapy, a stutterer might have no progress to show the next day, but the patient is tired because he or she worked so hard, Goggans said. “This creation is offering a promising alternative that can be discreetly and easily used every day by adults,” he said. While the device does not cure stuttering, it helps the user reduce his or her stuttering frequency and can improve the client’s quality of life, Snyder said. “The team plans to include the prosthetic device within a holistic therapy program to better serve the real-life needs of stuttering clients,” he said. 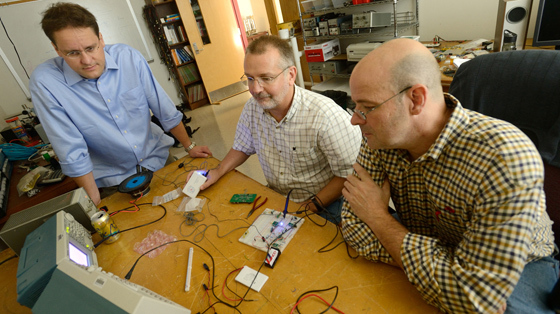 University of Mississippi professors Greg Snyder (left), Paul Goggans and Dwight Waddell conduct tests on a prototype of the prosthetic device they created to help people who stutter speak more fluently. UM photo by Kevin Bain. About 1 percent of the global population stutters, representing a dramatically underserved population that has few alternatives available for effective long-term treatment. As a result, the stuttering population often suffers severe social prejudices that hinder educational and occupational opportunities. “Building confidence and self-esteem in people who stutter is life-changing,” Waddell said. Though the new device is still being developed and tested, its potential benefit for people who stutter is clear. “The stigma surrounding stuttering is overwhelming and cruel,” Snyder said. “For any number of reasons, I was able to successfully emerge from the challenges of stuttering and have stayed focused on finding a new and better treatment for others. It just makes sense to me that if we can wear prosthetics like eyeglasses to help with our vision and hearing aids to enhance our hearing, then why not a prosthetic to help with speech?” The Technology Commercialization Initiative at UM is funded by a grant from the U.S. Small Business Administration. SBA’s funding should not be construed as an endorsement of any products, opinions or services. All SBA-funded projects are extended to the public on a nondiscriminatory basis.